Whilst Autumn is a time for crisp air, changing colours and cuddly jumpers, it is also the beginning of the holiday season. 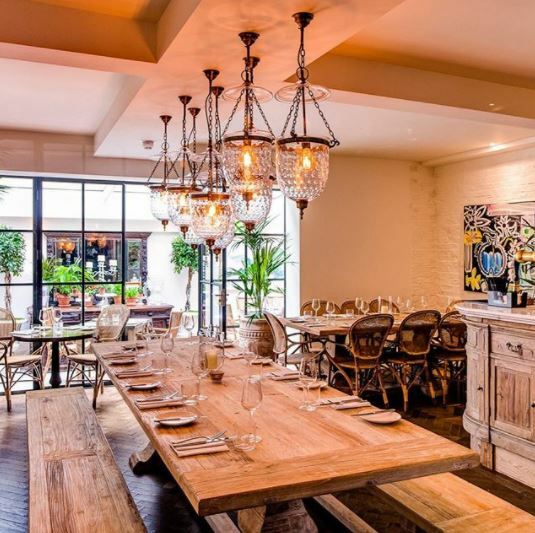 From chic cocktails to hearty pub lunches or festive outings, we can tell you where to celebrate Christmas in the Marble Arch area. Create the traditional and celebrated classic British Christmas with the best of the seasonal larder. The relaxed, but upscale setting paired with the Christmas menu featuring updated favourites like fois gras terrine, maple glazed duck breast, poached pear in red wine star anise and traditional Christmas pudding is the recipe for festive cheer! 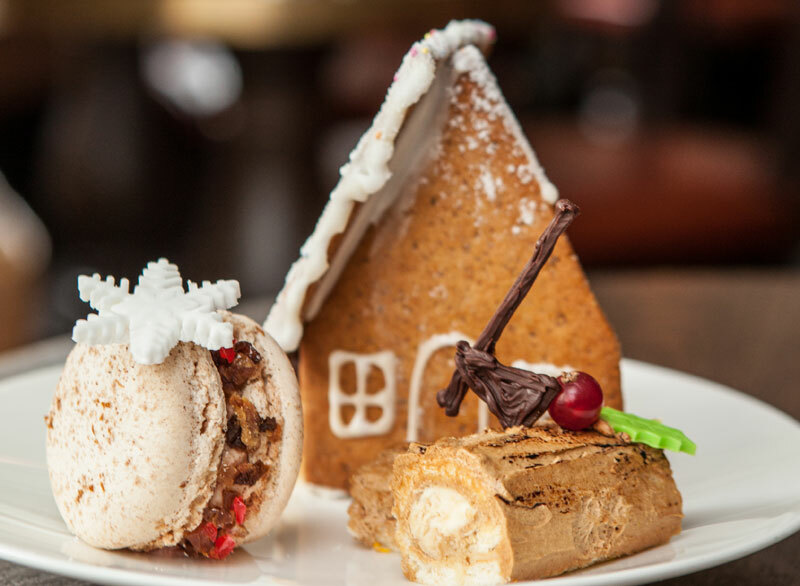 Also, don’t miss their famous Festive Afternoon Tea including mini holiday sandwiches like parsnip, chestnut, sprout tat, scones with mulled plum jam and mulled apple and gingerbread noel log. This pub is the ideal choice for a mix of casual and classy. The perfect place to stop for a cheeky drink and some sleek pub grub down straits, or head to the first floor where it boasts a beautiful and elegant restaurant for dinner, private hire and events. 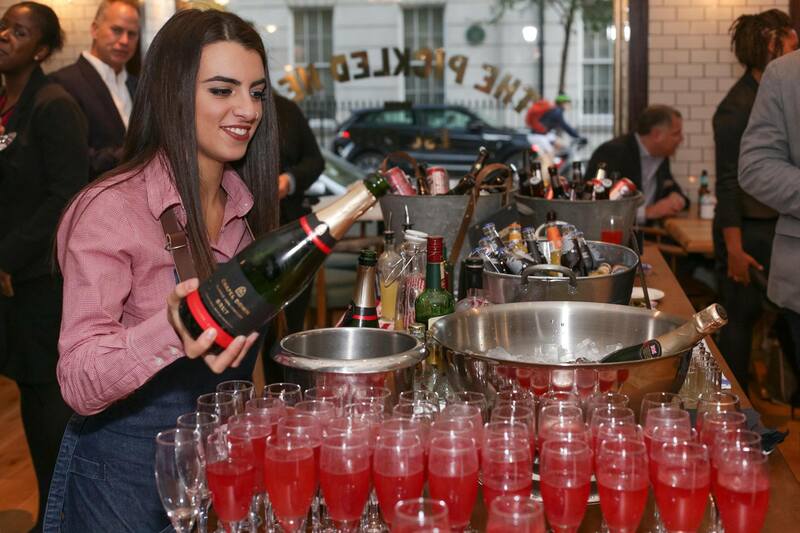 This award-winning pub is a staple in the Marble Arch area since 1995. The comprehensive blackboard menu caters to food lovers of all persuasion – from vegetarians to the health conscious, from gourmands to meat lovers – and changes weekly. Enjoy a roaring fire and the welcoming ambience. The best wines from France and the New World are hand-picked and are changed every six months. From reasonably priced house wines to the best Bordeaux, the Chapel’s wine list has something for everyone. 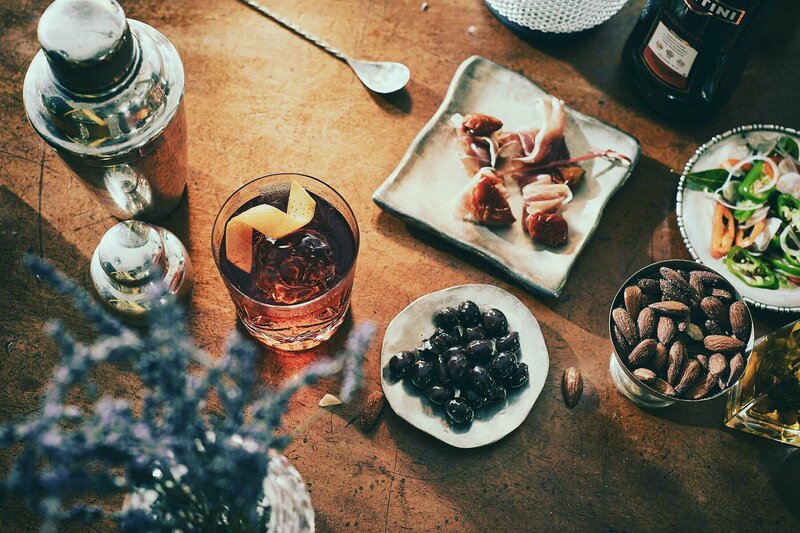 A sumptuous and eclectic cocktail lounge with pioneering drinks creator Tony Conigliaro behind the bespoke menu. The specialty winter drinks menu will hit the spot for all tastes, like ‘Fallen Leaves’ with wood vodka, verjus & roiboos soda – or maybe try ‘Le Sphinx’ mixing Orange Neroli Honey, Ambrette Bitter & Champagne. The Festive Magnum red wine is incredible. If it’s whiskey and meat you’re after, this is your heaven. Lord Wargrave smokes all its meat in-house and probably do the best St. Louis pork ribs in town whilst touting over 230 different whiskies. They also have a great selection of rotating cask ales and keg beers, and the Sunday roasts are second to none. Plus, they hold some excellent events from meeting the brewers to classic pub quizzes! 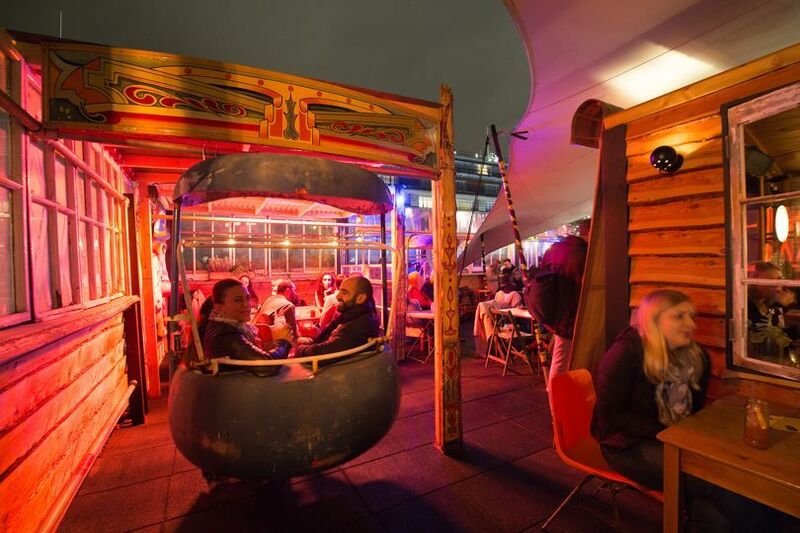 A temporary winter rooftop bar overlooking Oxford Street. Expect cheese and lots of it! The menu offers grilled cheese sandwiches, raclette, Mont d’Or baked in its spruce box and served with sourdough. There’ll also be petit plats including charcuterie boards. Sip on thematic winter cocktails like flasks of eggnog and hot gin punch. With space for up to 100 guests and a private hut for 20 guests, it’s ideal for Christmas parties. A local independent butcher, deli & grill. The butcher store drives the daily food offering which features grilled steak & chips, burgers & pies – all straight from farm to fork. Perfect for different team outing – Boxcar’s butchery classes, where their experts will guide you through the skills required, will teach you what to look for when buying meat and how to cook the perfect steak. Ready for a pickled twist? You better be, because this new Marble Arch haunt plays tricks on British classics, like ‘Egg & Soldiers’ for dessert – a delicious white & dark chocolate mousse set in egg shells with brioche toast dippers. 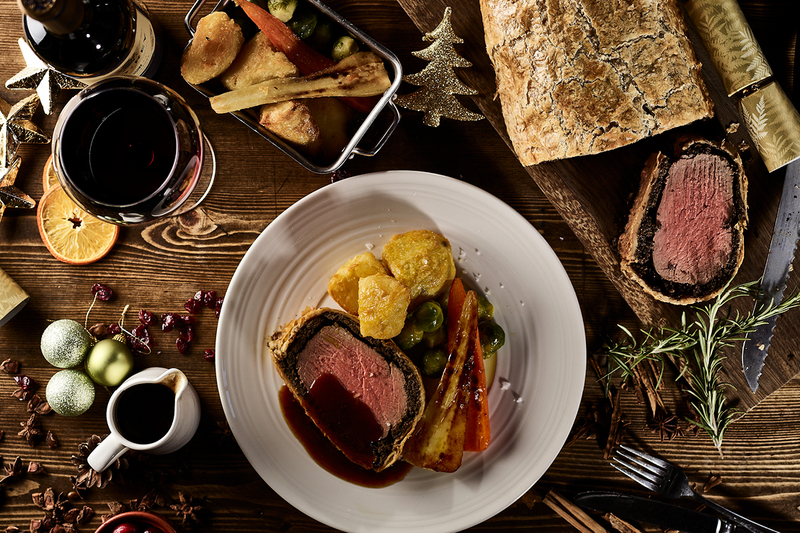 Or, try their inventive Christmas Party Menu featuring ‘the chicken and the egg’ to start, indulge in braised ox cheek with ‘horsey mash’ and sticky red wine sauce, and finish it all off with orange chocolate pudding with cinnamon custard. Don’t leave without trying a seasonal cocktail too. Treat yourself, your team, your partner, family or friends to the most unique, fun-loving and popular show in London! Filled with jazz, cocktails and tap dancing, you can’t miss this opportunity. PLUS Marble Arch’s dining and leisure quarter is celebrating the show with exclusive pre- & post-theatre menu specials for all ticket holders. Lanes of London, Roti Chai, Boxcar, The Gate Marylebone, Stuzzico, Bernardi’s, Momentus, Vinoteca, Snowflake Gelato, As Nature Intended and Connaught Village are all offering delicious delights for show goers. Scandinavian-inspired restaurants and bar housed in a historic building. The menu even has a separate section for fika, the Scandi tradition of breaking for tea, coffee and cakes. The style of cooking rotates with the seasons! 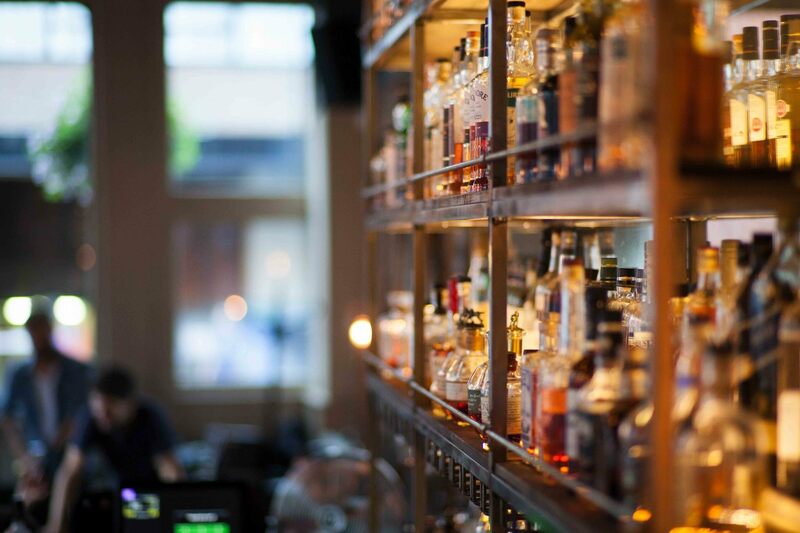 You must try the handcrafted cocktail list, which offers gin’s Nordic cousin akvavit, and Swedish single malt whisky. Although we love Rudolph, we suggest the Nordic Reindeer carpaccio with lingonberry, sorrell and pickled swede all washed down with a ‘Freudian Slip’ consisting of Hallands Fläder Akvavit, lemon juice, lychee liqueur, ginger and pink peppecorn syrup and prosecco. 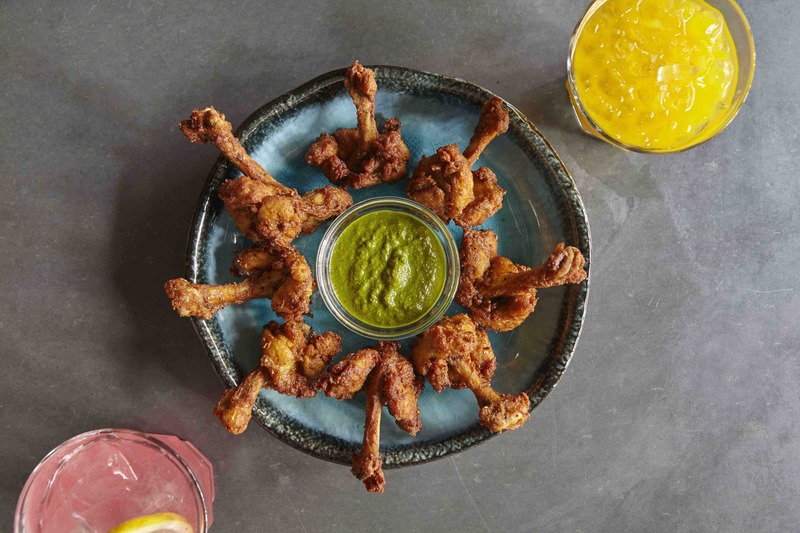 A restaurant of two halves: a fun, modern Indian street food kitchen upstairs and a curry-focused restaurant downstairs. Inspired by Indian Street Hawkers & Roadside Cafes, traditional recipes with contemporary twists. The dishes are tapas-style small plates and regular plates. Be sure to get the Chai Berry cocktail for some cool winter vibes. This firm local favourite is one of London’s best Thai restaurants… in the basement of a classic pub. You’re in for a different kind of Christmas whether you’re after Thai classics like Pad Thai and Green Curry or chef creations like Stir fried duck tongue with pepper and garlic or Spicy Pork Liver Salad. Plus a cosy open fire in the pub.